A famous statement says “We are what we eat”. Maybe it’s true but not really complete. In the last months my love for food took a different direction respect to the past, now I also love cooking and experimenting with food, so the best sentence for me now is “I am what I choose to eat and cook”. I feel a pleasure in any detail of the process from the choice of the recipe to the modification I will do and finally the way to present it on the plate. Obviously the final taste and eating experience has a great value and if I cook for other people I will be worried till the last bite. My must in terms of taste is to use only high quality products and my last Australian Discovery was the best discovery I could have been done: AussieFarmers. 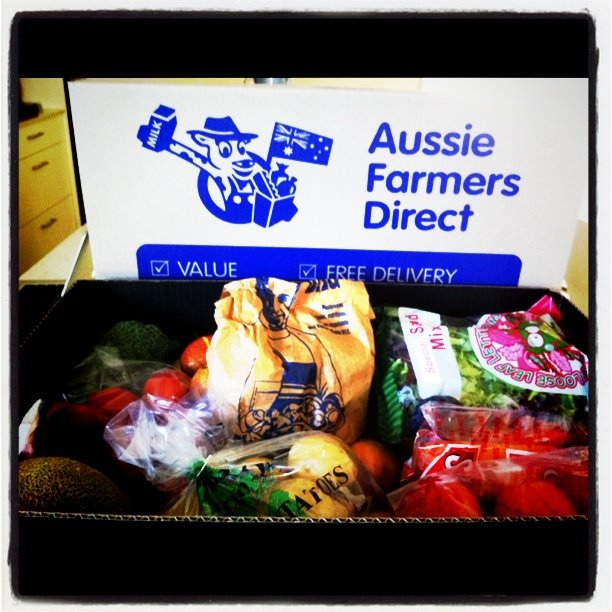 Aussie Farmers Direct is a free home delivery service providing fresh products that are 100% Australian owned and produced. Twice a week they deliver fruits, veggie, bread, milk and meat at my door. Products are fresh and savoury. The quality is amazing and the prices are lower than the ones at Deli or supermarkets. Also the Customer Care Service is really helpful and careful. I can imagine how many calls they have to manage due to a website which is a bit complicated and not user friendly, but they are always very nice. I found my way to support Australia and eat the best products. This post can sound as a paid post but it’s not, I’m so happy about their service that I’m trying to spread the voice as much as I can, because they really deserve it.